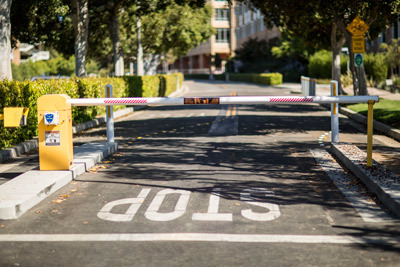 Roadways, service roads, parking structures and lots, and loading zones on the UCI campus are generally accessible, with the following exceptions. 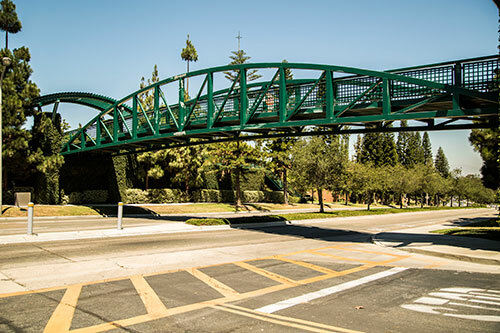 Three bridges on the UCI campus have less than 15'6" clearance and are considered "low clearance" bridges per California MUTCD standards. Advance roadway signs are in place warning road users of these bridges at Athletics and Palo Verde, allowing vehicles to select alternate routes. Please send an email to traffic@uci.edu for assistance with a traffic plan if you drive a tall vehicle or delivery truck on the campus roadways. Athletics Pedestrian Bridge - Spanning West Peltason Drive at Crawford Hall (Bldg 903 on campus map) 13'0"
Palo Verde Pedestrian Bridge - Spanning East Peltason Drive at Palo Verde Road 15'0"
Watson Bridge - Spanning Campus Drive at University Town Center 15'6"
Engineering Pedestrian Bridge - Spanning Engineering Service Road at Engineering Tower 16'0"
Science Library Pedestrian Bridge - Spanning West Peltson Drive at Science Library 17'0"
Mesa Pedestrian Bridge - Spanning Mesa Road at Mesa Parking Structure 15'0"
Fine Arts Pedestrian Bridge - Spanning West Peltason Drive at School of Fine Arts 20'0"
Continuing Education Pedestrian Bridge - Spanning East Peltason Drive at Continuing Education Building 18'0"
Please make note of parking structure heights when driving taller vehicles to ensure your safe passage through the structures. East Campus Parking Structure 8'2"
Social Science Parking Structure 8'2"
Access to some service roads or other areas is restricted due to high pedestrian activity. For pedestrian safety, selected areas of campus are open only to authorized vehicles with access to campus gate arms. For information about these restricted areas for delivery purposes or ADA access, email parking@uci.edu. 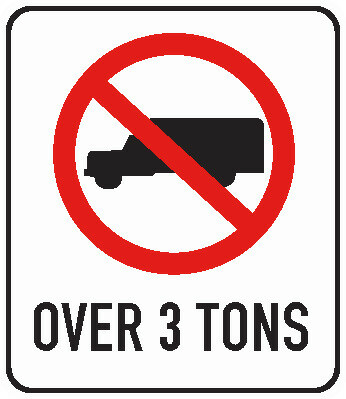 All construction vehicles over three tons are subject to roadway restrictions. These vehicles are not allowed on campus Monday-Friday from 7pm-7am, or on weekends without prior approval. Email traffic@uci.edu or call 949-824-2691 at least 48 hours in advance for more information and to schedule vehicle access.